Two years ago, when my son was diagnosed with food allergies, I never imagined I’d be endeavoring to make vegan foods. And surely, I never imagined that I or my husband would actually enjoy a dish that didn’t utilize real cheese or any of the numerous dairy foods we have both grown up eating. Lasagna is one of those dishes, I have avoided making, simply because I can’t imagine anything tasting better than ricotta and mozzarella. Blend ingredients and use in recipe as substitute for ricotta. May add water to achieve “ricotta” texture. Boil noodles for 8-10 minutes according to the package. The goal is to cook the noodles “al dente” or on the firmer side so that they do not fall apart during assembly. 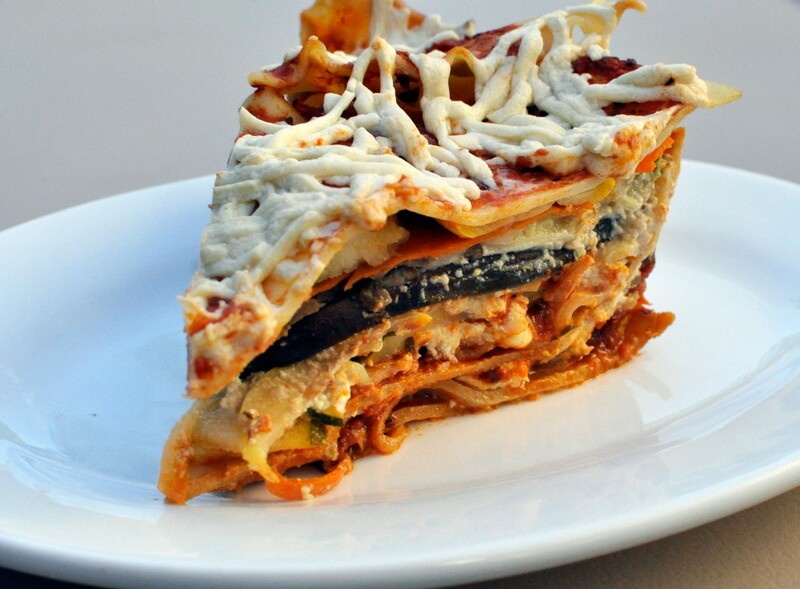 Assemble in a baking dishes alternating between pasta sauce, noodles, ricotta, veggies, and Daiya. On the final layer, top with Daiya and bake at 375 degrees F for 25-30 minutes until cheese is melted. Despite the fact that the recipe is free from animal products, it was surprisingly delicious. The “ricotta” has a rich nutty flavor and the texture you would expect in a lasagna. Daiya is melts well and is the most palatable cheese alternative I’ve tried. Prepping the dish (including slicing the vegetables, making the ricotta, and assembling the lasagna) is time-consuming but well worth it as you’ll likely have leftovers.